Sorry, SeaWorld. Floating Orcas AREN'T Normal. SeaWorld promoted a video about Tilikum last week as part of its desperate PR campaign to save the sinking marine park. 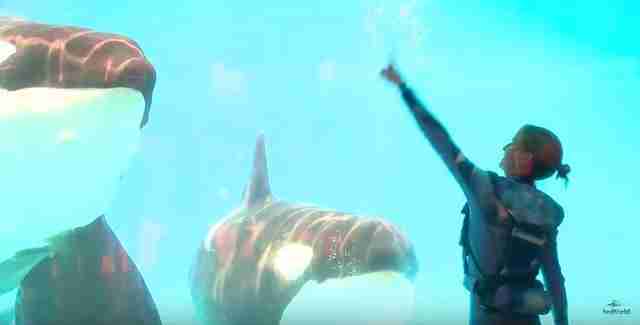 In the video, a cheery SeaWorld trainer tells the camera that Tilikum's lethargic floating - or resting, as she calls it - is a perfectly normal orca behavior. "[Audiences at SeaWorld] might see him at rest, because, you see, like all animals, killer whales do rest," she says. Once again, SeaWorld's twisting the truth. Many of SeaWorld's orcas, like Tilikum, can often be seen listlessly floating at the top of their tanks or on the tank floor, sometimes for hours on end. But while SeaWorld would have you believe that their whales are just taking naps, floating is hardly a normal behavior for wild orcas. "One of the most distinct characteristics of captive whales versus wild ones is their tendency to log [float in place]," Naomi Rose, a marine mammal scientist at the Animal Welfare Institute, told The Dodo. 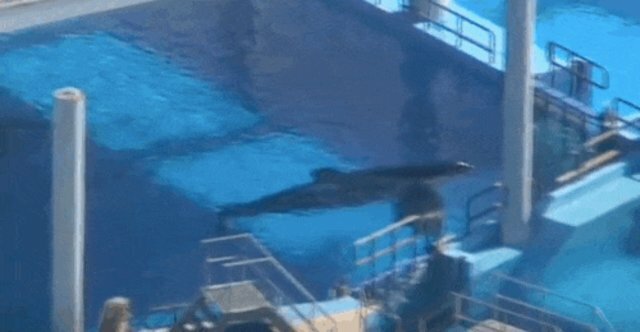 While it's "extremely rare" for wild orcas to stay still for more than a minute or two, Rose explained, Tilikum has been seen floating motionless for up to three hours. Of course, wild orcas do rest. But they don't sleep like people do - or stay still like the lethargic whales in SeaWorld's tanks. Because orcas lack the ability to breathe unconsciously, they'd drown if they drifted off to sleep like humans. Instead, cetaceans like orcas practice something called unihemispheric sleep, where they turn off half their brain at a time so they're still conscious enough to surface for oxygen. This means that resting orcas are still awake enough to slowly swim next to their large families and keep an eye out for dangers - and in the wild, they don't stay still. Though they often swim very slowly when resting, and sometimes stop for a minute or two at a time, they never spend hours floating listlessly like SeaWorld's orcas do, Rose said. "It's very unique to captivity; it's very, very uncommon in the wild," Heather Rally, a veterinarian who works with PETA, told The Dodo earlier this month about the captive floating behavior. "It's believed to be the result of chronic stress, boredom and inhibition of natural behaviors that occurs as a result of inadequate living conditions at places like SeaWorld." "The only time you'd see an orca floating in the wild is if they're stranded," she added. "And I wouldn't call that floating." So while a few minutes of stillness would be normal, the protracted, motionless floating you'll see at SeaWorld isn't just "rest." Rather it's exactly what it looks like: the result of captivity and boredom in tanks where there's nothing to do but float. And float. And float. Rose said it could also be a sign of depression, since some whales seem more prone to floating than others. And unfortunately, it isn't a harmless quirk of captivity, either; this frequent floating can actually be dangerous for the whales. SeaWorld's whales often suffer from severe sunburn since they spend so much time floating in the sun, and at least two orcas have died from mosquito-born illness, which they never would have encountered in the depths of the ocean. But worst of all, their large bodies are built for constant movement, Rose said, and the floating behavior means that many of SeaWorld's orcas are far less fit than their wild counterparts - which isn't good for their physical or mental health. "They're the ultimate couch potato," Rose explained. "When you talk to some of the trainers when they aren't being watched by their supervisors or their bosses, they'll tell you, 'Yeah, these whales are out of shape.'" So once again, SeaWorld's distorting the truth to hide the sad reality of their captive orca program from the public. "[Tilikum and his companions are] doing something that's not natural," Rose said. You can watch SeaWorld's misleading video below - and click here to read about some of the other problems with it.